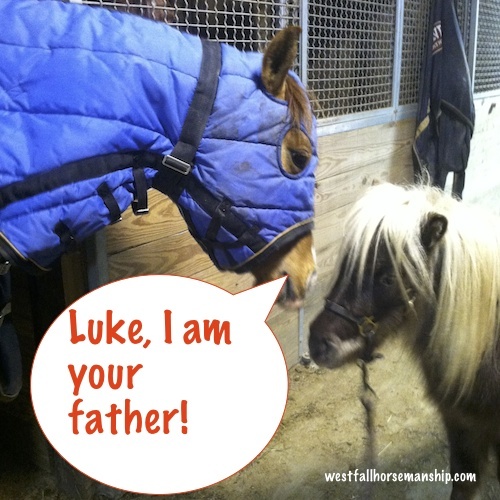 What is your input on blanketing a horse or not in the winter and also how cold is too cold to let them out in pasture? 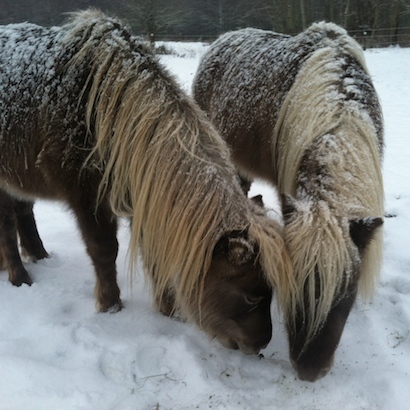 “What is your input on blanketing a horse or not in the winter and also how cold is to cold to let them out in pasture?”-Kimberly M.
I think that there are valid reasons both for and against blanketing horses and each person needs to evaluate what is best for their horse. I grew up in Maine and we never blanketed our horses. Sometimes the thermometer, without windchill, would go as low as -40…below zero. It got cold. Thankfully the wind didn’t blow when it was that cold and our horses grew thick coats and never shivered. All was good. My mom still lives in Maine but she has different horses. One horse is in his 20’s and is a hard keeper. He grows a thick hair coat and doesn’t shiver but putting a rain sheet or waterproof blanket on him when it is extremely cold helps him to conserve energy and hold his weight better. The other is a middle aged mare who is an easy keeper but naturally doesn’t grow much hair. I know because she lived with me for years and we kept her in a pasture with a run-in shed. Each year everyone else in the pasture grew enough hair to stay warm but this mare would only grow an average hair coat and then would shiver. Some people have told me that shivering is ‘natural’, which is obvious in one sense of the word, but whenever I have personally experienced shivering I have found it to be very unpleasant. I am convinced that some horses are ‘naturally’ given to growing more or less hair and as the mare can’t migrate south…I sent my mom a rain sheet and a waterproof blanket. When I have horses in training that I am riding multiple times per week I keep them blanketed. I do this because if I don’t then they tend to overheat when working…imagine dressing in your best winter overalls and coat and then shoveling snow for an hour straight. Heavy winter wear is not the best when you’re doing heavy work. Every time I make that mistake I end up needing to remove layers, something my horse cannot choose to do if it is hair. By blanketing my horses that I am working I can help them regulate their temperature plus I can help them cool out quicker. A horse with a heavy hair coat that does get soaking wet from a workout can take hours to cool out and dry properly. A horse that has been blanketed can be cooled out in thirty minutes or less with a wool cooler. The choice to blanket also comes with the responsibility to check and maintain the horses regularly. If I have horses that I am blanketing it is a lot of extra work in the fall and the spring. I have to pay attention to the daytime and nighttime temperatures and change their layers accordingly. For a fully blanketed show horse it is normal to change their layers every ten degrees. 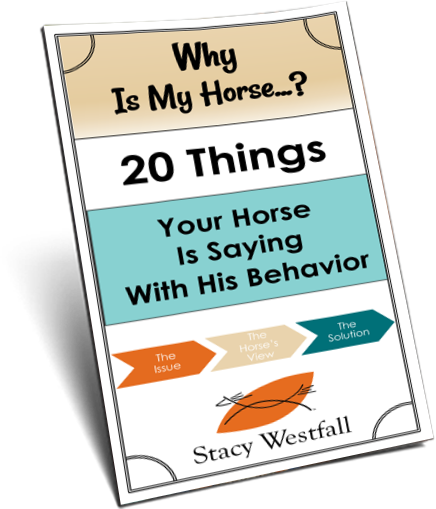 I do not choose to blanket horses just for the fun of it…it is far too much work if that is the only reason. If you don’t need a short hair coat because you are working the horse regularly but want to blanket sometimes then consider only adding below a certain temperature. If you choose to only blanket when the temperature is below ten degrees then your horse will still grow a pretty thick hair coat. Plus by selecting a low temperature like zero or ten degrees you won’t have all of the extra work in the spring and fall. I prefer to leave horses that aren’t working regularly without blankets and allow them to grow as much hair as possible. I also recognize that some times blanketing can be either helpful, as in the training situation, or best, such as with the hard keeper. As far as how cold is too cold I think there are different factors to look at. How healthy the horse is, what type of shelter or wind break is available, and how much forage is available are all part of the equation. Keep in mind that a great source of internal heat for horses in the winter is digesting hay and fresh, unfrozen, water is always a must. I have more often kept my horses in because of ice or poor footing instead of the weather being too cold. Unfortunately, someone will leave a comment saying that it is totally natural for horses to endure any weather. While it is true that horses live in the wild, they also can suffer in the wild. I have personally seen horses with half their ears because the tops were frozen off…natural, yes, but not something I’m interested in. I think each person needs to evaluate their situation. Some places are going to get extreme wind, others extreme snow or ice and still others extreme cold, each brings its own challenges. 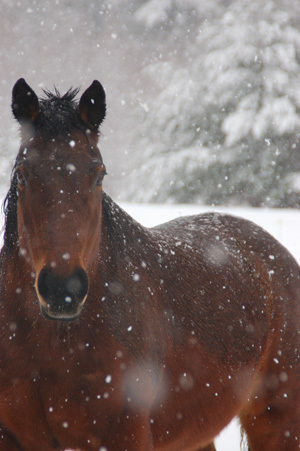 Keep in mind that sudden or unusual weather won’t allow the horses time to adapt. Often I have to laugh when I go out in the cold with my horses. Some of my best memories are with my horses in the winter. They tend to be fresh and full of energy and for the most part they seem to handle the cold weather much better than I do. My mare is a little underweight, so she shivers. Good to here I’m doing the right thing putting a blanket on her. Her fur coat is a little thin since I started putting the blanket on, but she doesn’t shiver anymore. We don’t blanket our own unless they are still damp when we turn them out (which hardly ever happens, because we put the fans on to dry them after we work), but we do feed A LOT of hay when it is cold, and make sure their teeth are always maintained so they can eat lots and stay comfortable. Of course they all have their own shelter. If it’s been Wet and cold, I will bring my older mare in overnight, and get her dry and fluffy again before she goes back out. We’re in the high desert where snow, rain and below-freezing temperatures are infrequent, but the wind often gets strong. We don’t have a barn nor run-in sheds, so blanket at night when the “feels like” temperature is expected to get to 35 degrees or lower. We use nylon blankets with fiberfill to break the wind, and also have waterproof blankets for rare wet nights. The horses and donkey stay in their respective covered corrals at night when blanketed to help keep them from destroying each others’ blankets. Otherwise they’re turned out 23 hours (all but while we distribute Burmuda grass in the turnout) seven days a week. To each their own but when you wear a jacket or coat you are protecting your core that is the same thing you are doing when blanketing your horse. If it is nonsense my horse wouldn’t shiver in the cold and stop shivering when he has his blanket on. I am in Arizona and typically don’t blanket unless the temperature drops below freezing and then only keep the blankets on at night. With that said if we get a bad rainstorm with a chilly night I will blanket to keep the horses from having to go into a cold night wet. I have a 23 year old mare that looks like a wooly mammoth so I don’t blanket her unless we get into the 20s. I have a 21 year old gelding who I have had since he was 2 and he has never developed a thick winter coat even when we lived in Arkansas so I have to blanket him or he shivers, typically mid to low 30s. I have a 3 year old with a light coat but is undergoing some health issues so I make sure he always has a warm dry place to lay down and blanket him if the ground is damp and when temperatures get into the low 40s. I always make sure to check under their blankets early in the morning and if they feel too warm I open up the front for a few minutes to let their body temp adjust gradually then take the blanket off. I always make sure I have a blanket that fits any horse at my barn just in case, you never know when you may get a freak storm and the temperature drops significantly overnight or a horse falls ill and needs a little more warmth to ease the strain on their system. I have never seen my mare shiver how ever she is also prone to skin irritation from being in rainy/snowy conditions for a long time, so I also through a rainsheet on her. As long as I don’t keep them on all the time (only when needed) their coats come in as normal. I have no idea what that would be like, we have the opposite problem here in the tropics, when it just get far too hot and humid to ride and you get problems with rain scald!! We had two Morgan geldings when I was growing up, They weathered outside with a hay shed/shelter. The only thing we did was watch them when we had a freezing rain, sometime they got a canvas cover if they showed stress. Food and fresh unfrozen water a necessity. My mare grows a thick coat and is pastured 24/7 in PA with access to her stall. The only time i put her sheet on her is when i know it’s going to be freezing rain or snowing but once it’s done i take her sheet off and hang it inside to dry. Luckily she is smart enough to go inside her stall most of the time anyway but i like to know that she isn’t going to have a soaking wet coat when it’s freezing out. I live in Northern California. My horses are in large pens and have access to a shelter. I have 2 old geldings that I blanket when it rains or gets below 30 degrees. My 6 year old Paint mare doesn’t grow a thick coat so I blanket her too when it rains. I also have two miniature horses. They grow really thick coats and I don’t blanket them but I have blankets for them and if I see them shivering I will blanket them too. Anytime a horse starts losing weight, I blanket. A warm horse is cheaper to keep in good flesh. Great article, Stacy! 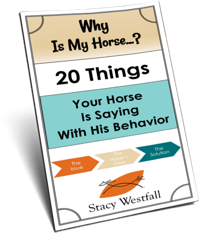 You touch on everything — with the biggest factors being a) health of the horse, b) available shelter, c) available forage, and d) adaptation. I.e., I’d never purchase a horse in a southern state, move it up to Minnesota and expect it to grow an adequate coat for below-zero weather 2 months later. I, too, grew up in a cold, northern state (central MN), and our horses have never worn blankets. Why? Because they’re healthy, adapted to the climate and have 24/7 access to a shelter, fresh water and good hay. They grow woolly-mammoth coats and are perfectly happy and healthy. No frozen ears, no grumpy attitudes and the coldest it’s been was (without windchill) minus 40. Add the windchill and (they said) it was comparable to minus 70. Of course, those horses also don’t get “worked,” either. They enjoy a light “retirement” every winter (no indoor arena) and only get trail ridden on warm days (you know, when it’s above 20 degrees…above 🙂 ). So that’s OUR experience — doesn’t mean it’s right for everyone. Thanks for the article — it’s a goodie. In our neck of the woods where it’s very wet, I waterproof-blanket when it’s also cold if there’s little shelter. I read up on blanketing, and for us here on the wet (west) coast, we need only blanket when it gets down to about -4 or lower if it’s also raining/windy. I agree with your opinion in regard to blanketing. Here in Florida, there are a variety of takes on this question. Most “show people” blanket and limit turnout accordingly. Those of us who take a more naturalistic approach (limited stall time or full-time turnout) do the opposite. My mare will be 30 in April, she isn’t holding weight and hasn’t the past two winters. When I know we are going to get freezing rain or rain I blanket her. She does fine in the cold and snow as long as it’s dry. She shivers in the rain and freezing rain, so I blanket them all……I think the cold rain and wind is worse than freezing temperatures. Once they are wet they can’t get warm. I blanket the horses that I ride here in the rainy northwest. No fun to ride a soaking wet horse. Thank you for this post. I have an easy keeper (…very fat) mare who does not grow a thick coat. She shivers when wet and cold and I have found that blanketing when the temps drop/rain falls helps her. I struggle when I ride her b/c she gets sweaty fairly quickly and takes a very long time to dry. I have 3 horses with very different needs. A gelding who is 25. He has a nice coat and I only blanket him if it drops below 30 degrees or is below 40 and windy or raining. Here in SC the temperatures fluctuate wildly, not giving him enough time to adapt. I have a 5 year mare that doesn’t grow much hair at all. In the winter she is in a stall from 5:00 pm to 8:00 am. If it is below 40 she is wearing a storm shield. Below 30 she gets a medium weight waterproof blanket. My younger mare, who has a nice thick coat, will be sweating if you blanket her at 40 degrees. So unless its raining or windy she doesn’t get a blanket until it’s below 30. Excellent article. I notice you mentioned the use of rain sheets to cut the wind. This is something I have adopted in the last few years which seems to help them on those blustery days. As for shivering, I have a horse that has collicked when cold, so I pay attention. You certainly have covered all aspects of this topic exceedly well. I also like how you end your article with the reference to wild animals, they might survive, but it’s not without cost. Great input from Stacy on blanketing. My boy gets a blanket when it drops to -15C. He is on a 40 acre pasture that gets a mean cross wind. He doesn’t have a heavy blanket. Just 200gram fill. But it is water/windproof and give me a piece of mind when I’m at home cozy in my bed. What are your blanketing habits? I put a blanket on my older horse. I had to remove it because two of the other horses would not leave her alone and would chase her into the trees. Trying to research and find out what I can do.